You’ve probably heard the term “ergonomics” before, but let’s nail down a definition. Ergonomics is the practice of designing products, systems, or processes that are easier and more comfortable for people to use. Basically, it’s the art of designing for people. Ergonomics considers how our bodies are aligned, supported, and move. The main focus is to make the things around us fit (or adjust to) our bodies to reduce injury and pain. Ergonomic office spaces are becoming more common as companies realize the benefits of stopping injury and pain before they happen. If an employee has to take a sick day because of back pain or is distracted at work because of headaches, that’s not good for business. Ergonomics gives businesses the opportunity to provide solutions that prevent injury and discomfort from ever happening. This is great for business because the health and comfort of employees is directly linked to productivity and profitability. Ergonomics gives businesses the opportunity to provide solutions that prevent injury and discomfort from ever happening. The most simple rule of office ergonomics is having a minimum of two points of adjustability. The first is the position of the arms and wrists; the second is the position of head, neck, and shoulders. A combination of ergonomic products, like a sit stand desk, adjustable monitor mount, and ergonomic keyboard tray, can help you achieve proper positioning to reduce fatigue. Creating a fully adjustable ergonomic workcenter will really change the way you work (for the better!). For good posture, whether sitting or standing, your feet should be flat on the floor and elbows should be at a 90° angle with wrists in a relaxed, neutral position. Neck, spine, and hips should be in a straight line. While sitting, knees should be at a 90° angle. In order to achieve this ergonomic posture, you have to be able to adjust your desk, monitor, and/or keyboard to fit your body. Improving your posture reduced risk of lower back pain, neck pain, and wrist discomfort. A sit stand desk is the best way to achieve proper ergonomic posture and have the flexibility to move when you need to. 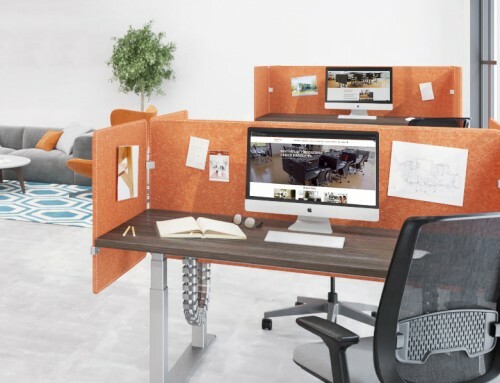 The best solution is an electric height adjustable desk because they’re easy to use, so you’re more likely to use it! 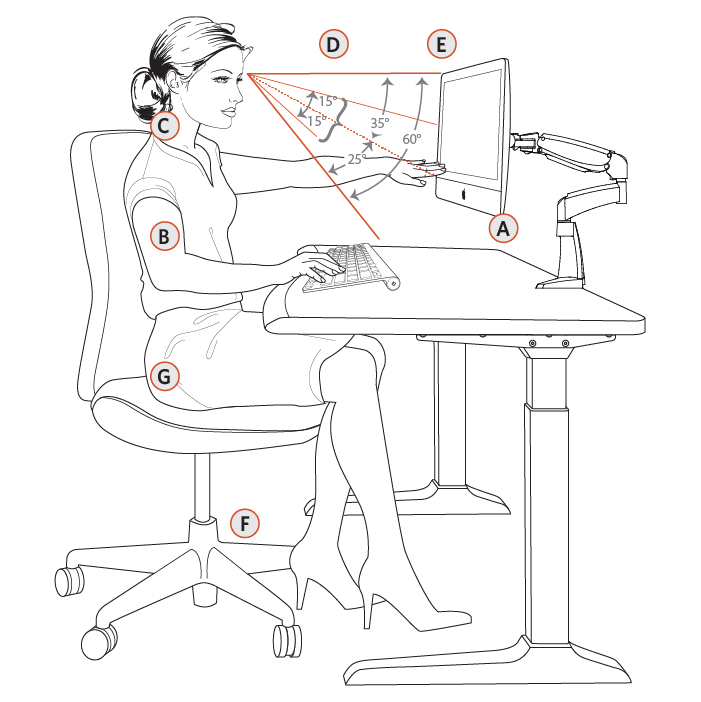 Being able to adjust the height of the desk means you can align it so your elbows and wrists are at the right angle without reaching or bending. A good adjustable standing desk works for the full height range of individuals, from the shortest females to the tallest males, sitting and standing. Read The Facts About Standing Desks to learn more about how to choose the right desk and get the most out of it. A sit stand desk is the best way to achieve proper ergonomic posture and have the flexibility to move when you need to. If you’re not on the adjustable stand up desk bandwagon, an ergonomic keyboard tray can allow you to get your arms and wrists in the right position. By adjusting height, tilt, and rotation of the keyboard, you can achieve proper ergonomic positioning. So you’ve got your arms in alignment, but what about your neck? An adjustable monitor arm mount can allow you to position the monitor so your neck is in a neutral position. The monitor should be arm’s distance away, with the top third of the monitor at eye level. This ensures that you’re never looking up to see your screen, which compresses your neck and leads to pain. Whenever you move and change position, like going from a sitting to standing position or vice versa, examine how your monitor is positioned and adjust it as needed. With good ergonomic posture, your body will be in a better working position to avoid fatigue, but what about your eyes? 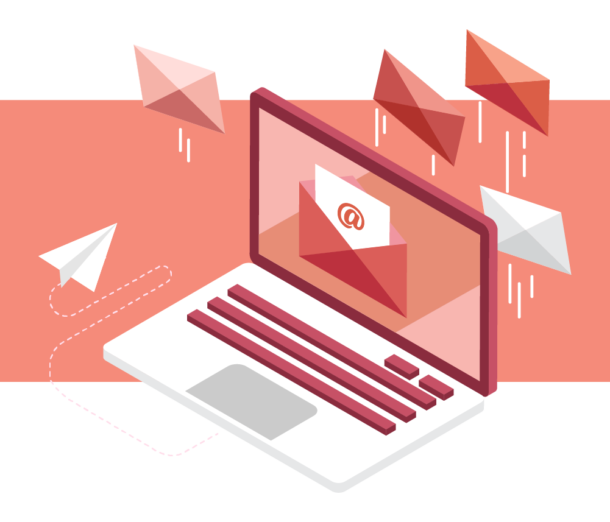 If your work isn’t completely digital and you have to read printed documents, you’re going to need some light. A desktop task light is a great way to get light where you need it, increasing visual contrast and reduces eye strain. The best kind of desk lamp is dimmable, adjustable, shows true colors, and doesn’t get too hot, like an OLED or LED light. If you do most of your work on a computer, protect your eyes by looking away every 20 minutes and adjusting your screen’s brightness and color temperature to minimize harmful blue light. Movement is good for our bodies and ergonomic office equipment can be powerful tools that allow us to move throughout the day. 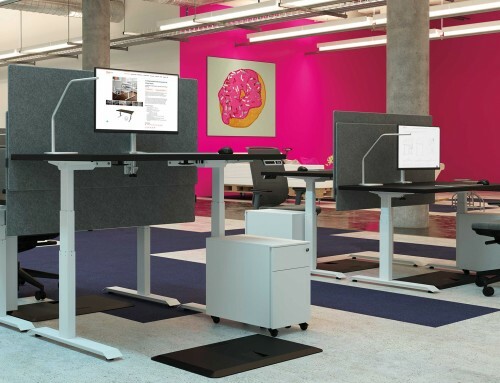 With sit stand desks, the goal is not to stand (or sit!) all day, movement is key. With businesses and employees putting a bigger emphasis on office ergonomics, we have to change the way we work. 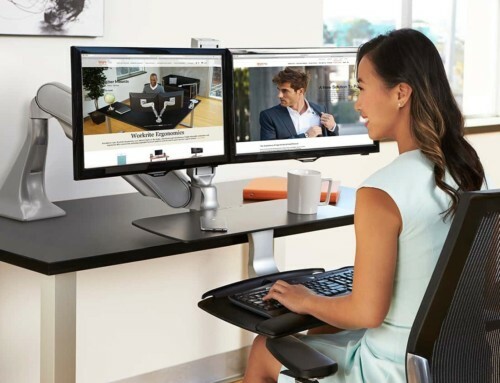 Starting with the right ergonomic office equipment, like an adjustable height desk, keyboard tray, monitor arm, and task light, and focusing on good posture and movement, you can work comfortably and productively all day.